Second only to the Martini, the Manhattan is one of the most iconic classic cocktails and one of my personal favorites. It’s a sophisticated cocktail named after the city of all cities and has been traced back to circa 1870. The exact history is often debated so I’ll let you read up on that yourself if you’re interested. The Manhattan doesn’t use many ingredients but has many complexities. Given that there are several popular varieties, it makes it a fun cocktail to experiment with. If you’re new to making cocktails it’s a great starter cocktail, for it has simple proportions with which you can experiment. Before diving into the recipes everyone needs to know the #1 rule of making Manhattans. Contrary to Mr. Bond, (who was quite wrong, actually), cocktails made of any clear liquids should always be stirred, not shaken. If a drink contains a juice, or anything cloudy, then you shake… but a drink like the Manhattan needs to be stirred. By stirring the drink you are able to achieve the appropriate coldness without interrupting the clarity of the ingredients in the final presentation. Shaking is needed when you’re using ingredients that don’t combine well without a vigorous shake. How long you stir depends on your ice and how much dilution you like in your drink, the longer you stir the less strong the drink will taste. The key is to dilute it enough so the drink doesn’t seem harsh but don’t stir too long or it will be watered down. Experiment with stir times and see how it affects your cocktail. These days Manhattans are often made with bourbon and sometimes Canadian whiskey but I recommend making it the classic way with straight rye whiskey. Canadian whiskey was often substituted as rye whiskey was hard to come by, but these days rye is making a healthy resurgence. They are often garnished with maraschino cherries but making your own brandied cherries makes them that much better. Now onto the drinks. I will feature the Classic Manhattan, the Dry Manhattan, the Perfect Manhattan and lastly a newer creation, the Uptown Manhattan. I tend to favor the Perfect Manhattan, but being a huge amaro fan, the Uptown Manhattan definitely piques my interest, and the flamed orange zest always adds flare when making drinks for guests. Stir, garnish with a brandied cherry and serve up. Stir, garnish with a lemon twist and serve up. Stir and strain into a cocktail glass. Flame the orange zest over the drink by squeezing the citrus zest into the drink while holding a lighter under it. Garnish with the orange zest and a brandied cherry. 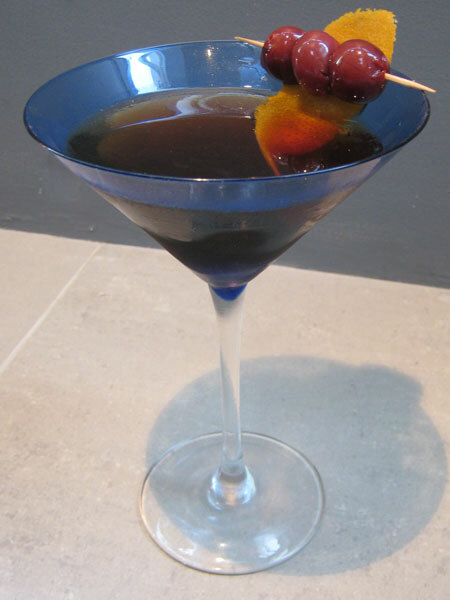 The Uptown Manhattan is a signature drink of San Francisco bartender Marco Dionysos. You will find it on the menu at the Clock Bar. in the Westin St. Francis in San Francisco’s Union Square area. Shaken, not stirred, will get you cold water with a dash of gin and dry vermouth. The reason you stir it with a special spoon is so not to chip the ice. James is ordering a weak martini and being snooty about it. exactly, the ice chips interrupt the clarity of the final drink. Am searching liquor stores for amaro after enjoying cocktail recently made of same with Grand Marnier and orange bitters. Research, it’s so tough! I love a Manhattan, the more chilled it is the more it warms me! One more note, the Biltmore in downtown LA does a fab cloudy Manhattan with caramelised slice of orange . . . .
Patti, not sure how far away it is from you but check out K&L wines in Hollywood for Amaro. They ship too. I had an Uptown Manhattan at The Red Cat in Chelsea Thanksgiging week and it was VERY good. The bartender there was a delight and really knew what he was doing. I can’t wait to return. Thank you! Thank you! Thank you! An over shaken manhatten comes out looking like low tide and does not taste right …. too much air in it. I like the taste of a top shelf bourbon. If I wanted a weak drink I would have added water! If you can’t take the alchohol, stick to foo-foo drinks. There is not such thing as a dry Manhattan; it’s called a Brooklyn.